- You’ll trigger this quest after completing Synth Retention and returning to the Institute. Once inside, seek out Dr. Ayo, the head of Institute SRB. If he’s not in SRB, sit down in a chair and wait for a few hours until he shows up. 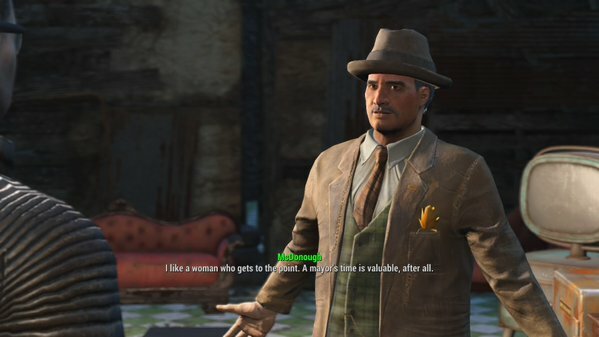 He’ll ask you to retrieve a report from Mayor McDonaugh, the head of Diamond City. - Head to Diamond City and chat with the Mayor. He’s in his office, up an elevator to the right of the entrance. Engage in some light conversation and he’ll give you a Report. Take this back to Justin for your reward. If you’re persuasive enough he’ll throw in 100 Bottlecaps. It’s worth noting that, among your companions, Piper will hate if you take a Report from the Mayor. - Come back every few days and Justin should renew this quest. It’s a decent, if rather boring, source of experience and possible caps. Yep, that’s preeeeetty much it. Just… moving Reports back and forth. No betraying the Institute, no outing McDonaugh, nuthin’.